Did you know that the late actor Leonard Nimoy wrote and starred in a one-man play about Vincent van Gogh? It’s logical. 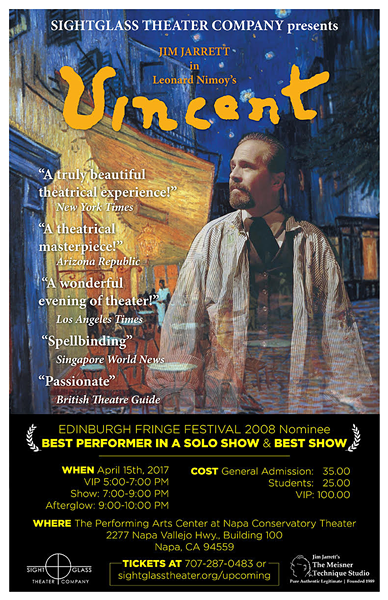 First opening in the early 1980s, ‘Vincent’ became a smash hit on Broadway and is still a favorite at festivals around the world. Since 1994, actor Jim Jarrett has taken on the role of Vincent, and this weekend he brings the impressionist artist’s passion and intensity to the stage for a one-night-only performance to benefit Napa’s new Sightglass Theater Company. A VIP wine lounge precedes the performance, taking place on Saturday, April 15, Napa Valley College Performing Arts Center, 2277 Vallejo Hwy., Napa. 7pm. $25–$100. sightglasstheater.org.